Over the last few weeks our kitchen sink has become slower and slower to drain. As a conscientious man, I did my best to ignore it, until it just stopped draining altogether. So I did what I always do…I pulled it all apart to try and fix it! As you can see from the photo it looks quite complicated, but working on the theory that water drains by gravity it’s actually fairly simple. With a bucket to catch any water that leaked out I set about taking all the plumbing off the sink bit by bit. It’s surprisingly easy, all the fittings are screwed on and don’t need to be super tight. The only gotcha is the little rubber rings that seal everything up tend to flip off, so keep an eye on them. At this point I’d like to point out how badly men in general deal with bad smells (those with children will already know this). I’m no exception, and there is a fresh level of hell set aside for the odour that comes out of any drain. 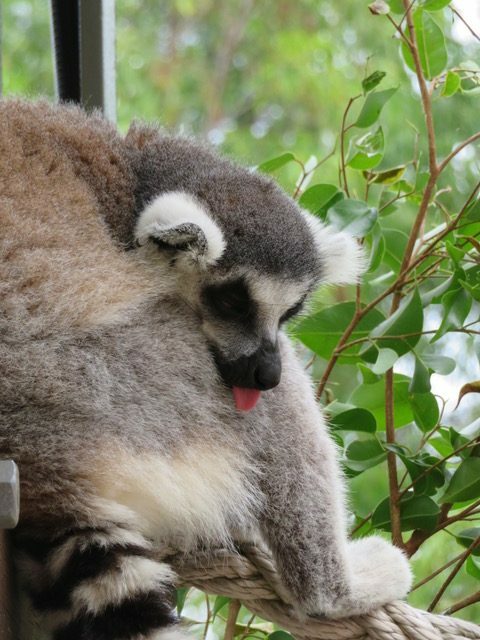 Even a Lemur can take apart a drain. Now it didn’t drain at all. With Sherlock Holmes like deductive skills, I figured that there was a blockage further down the tube under the floor. Bummer! 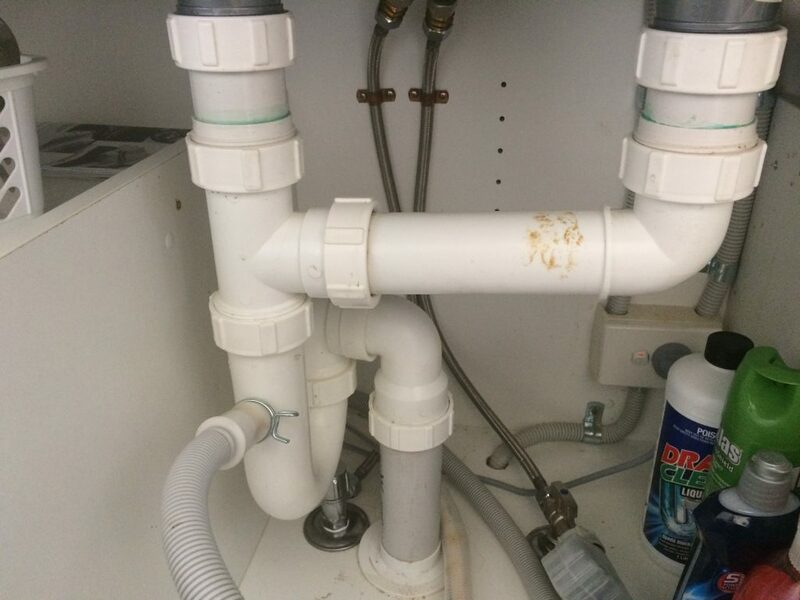 I had no idea how to get that out without buying a drain snake. So I went to work the next day and pondered. I’m a big fan of crowdsourcing, a problem shared is a problem halved and all that. The guy that sits in the cubicle behind me and I chat quite a bit, and when we are not dissecting politics (US or Aus), or putting the organisation to rights, or even discussing the finer points of home spray painting his 1977 Jaguar, we talk about what we have going on that makes us feel manly (not overtly though), and he had a grand idea to use the garden hose as a rammer down the pipe to dislodge any debris – Genius. I spent the rest of the day watching the clock count down till I could get back into it. Once I’d disassembled everything (again), I set about clearing the pipe, releasing more nauseating waves of bilious smells in the process. Next step was to check my progress – 5 litres of boiling water directly down the pipe disappeared as it should and I’d got it sorted. I re-assembled all the fittings and ran the tap for a while. Aaaaaaand it still didn’t drain. At this point the kitchen drain has consumed me for the better part of four days, and I heard the words no man wants to hear – “Darling, I think it’s probably time to call a plumber”. I like to fix things, or at least know why they can’t be fixed by me. It’s a problem I have and this was really eating away at me. I heard myself saying “Okay dear, I’ll call someone tomorrow from work”. The next day my colleague felt my pain and had a fresh batch of ideas to try. I had a tiny inkling in the back of my head about air flow in a drain, but not enough to form a solid thought. At this point Youtube and Google had failed but I vowed to give it one more crack. On the way home from work, we decided to pop in and buy a plunger. On arriving home, I diligently pulled the inspection plate off the sewer, and checked for running water from the toilet – all good. I went upstairs, situated the plunger and pumped. Once down, once up – there was a huge gurgle and all the water drained – I had an air lock that was stopping the water from getting past the u-bend! Crowd sourcing ideas will open up your mental model to a whole new level. I was quite upset by my inability to fix this problem, that is an emotional issue I think I need to look at within myself. Drains are very easy to pull apart and fault find. Sewer smells are next level gross, I can’t stress this enough. A $2.95 plunger can literally be a psychological saviour. A great way to problem solve is to crowd source – I do it all the time. Well done on another thing insourced saving you a plumbers fee. It’s amazing how good crowd sourcing can be, you’re right. We’re definitely glad to have saved the plumbers fee, but more than that, we’re proud we were able to solve it ourselves! Poopsie, you totally made me laugh with your comments about bad smells. This is a constant struggle for Mr. ETT as well. We understand your pride in “no actual vomit”! 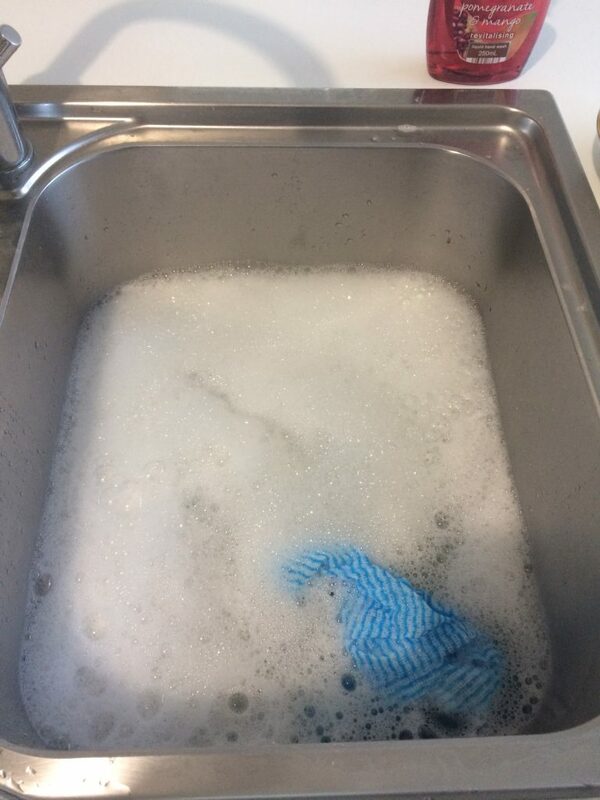 At this time I have to give kudos to AwP – a four day wait time for a working kitchen sink would have tried my patience more than a subtle suggestion to call a plumber! Crowdsourcing solutions really can be a cost saver. In the past, our ensuite began to smell like sewage. We tried to pin down the smell, and all we could put it down to was that the toilet seal must have become broken. Luckily we went to work that day and discussed it with colleagues, because someone else had had the same issue. The solution? Pour a bucket of water down the shower drain. We hadn’t used it for so long that the water had evaporated, so the natural seal had gone. Cost $0 and about 10 seconds. Poopsie is actually traumatised from when his kids were really young and they vomitted. Like traumatised so much, thinking about it displays a visible reaction in him! It’s amazing what you can find out when you ask around. It works so well! Also Googling- most problems can be solved with a quick search/YouTube video. Haha, this was a great post!! My husband is not a handyman at all, so I do all the pull-apart-ing of drains that is needed in our household. My greatest fear is also the smell!!! Luckily everytime I’ve pulled apart a drain, there has been no smell. Thank the smelly lords. You go girl! I am not handy, so I am always amazingly impressed when other people are!